On 27 January 2016, the Minister for Vocational Education and Skills, the Hon. Luke Hartsuyker MP, announced the outcome of the Expression of Interest process to identify Skills Service Organisations to support Industry Reference Committees in their work to develop and review training packages. Visit the Department of Education and Training website for full details. At the 20 November 2015 meeting of the COAG Industry and Skills Council it was agreed the Australian Government Minister for Vocational Education and Skills, the Hon. Luke Hartsuyker MP, would consult with VET stakeholders and all jurisdictions on reform options to improve assessment in VET. Priority areas for investigation are approaches to strengthening the skills of VET trainers and assessors, consideration of improved validation of assessment, including potential for greater industry involvement, and options for tougher regulatory interventions. Visit the department's website to find out more about how to participate in the consultation process. Submissions close Friday 11 March 2016. The Australian Government has made important reforms to the VET FEE-HELP scheme to improve the quality and effectiveness of the scheme and to better protect students taking out a VET FEE-HELP loan. The Higher Education Support Act 2003 as amended by the Higher Education Support Amendment (VET FEE HELP Reform) Act 2015 enacts new measures from 1 January 2016 to further strengthen the scheme. These changes aim to control growth and lift the performance of training providers ahead of a more fundamental redesign of the scheme. To see further updates about the reforms visit VET FEE-HELP Reforms. The Government will redesign the VET FEE HELP scheme from 2017 so that it is sustainable over the long term, and ensures students have access to affordable and high quality training that leads to employment opportunities. The redesign will likely require legislative changes, and will be informed by consultation. Further information on the redesign will be made available on the department’s website over the coming months. The Australian Training Awards recognise the exemplary achievements of business, registered training organisations and everyday Australians in vocational education and training. If you are an employer, apprentice, trainee, vocational student, training provider, secondary school, training practitioner or industry organisation, I encourage you to take part in the Australian Training Awards. It can offer you Australia-wide recognition and the chance to be known as the best-of-the-best in your field, nationally. Visit the Australian Training Awards website to see which award categories are now open for entry. The Department of Education and Training is currently reviewing resources related to the Australian vocational education and training (VET) system. As part of this process, the Back 2 Basics fact sheets are being updated to reflect changes resulting from the Australian Government’s ongoing VET reform and will be incorporated into a suite of information materials for VET. These materials will ensure accurate, comprehensive and practical information is accessible to those involved or interested in the Australian VET system. Resources will be published on the department’s website as they are updated. Yenbena Training Centre, Barmah, is a registered training organisation located on Yorta Yorta traditional lands near the Murrray River. The centre provides an example of best practice in relation to increased and targeted employment and training outcomes for Aboriginal people, community participation and capacity building. Read more. The scholarship, which provides $6,000 for an individual or group of practitioners to research innovative ways to work with industry or community to meet skill needs, supports applied research between TAFE and industry. Applications including co-sponsorship contributions by industry are strongly encouraged. ForestWorks, in their alliance with the National Farmers Federation, has been successful in securing Australian Government approval for a Skills Service Organisation (SSO) role through the creation of a new entity, Skills Impact. Following an announcement by the Minister for Vocational Education and Skills, the Hon. Luke Hartsuyker MP on 27 January, Skills Impact was appointed as the national SSO for a diverse range of grown and renewable resource industries, including forest and wood products and pulp and paper industries. A not for profit, industry-owned company, Skills Impact is one of just five organisations awarded an SSO role by the Commonwealth following a competitive tender process. SSOs will replace the role previously held by Industry Skills Councils in the review and development of training products, including skills standards and qualifications, and will work under a new model that will support a series of Industry Reference Committees (IRCs) to develop modern and relevant training packages that reflect the needs and priorities of employers. Mr Michael Hartman, ForestWorks’ CEO, said they were looking forward to working with Skills Impact and the various IRCs formed under the new model to ensure the skills standards and qualifications within the forest based industries continue to receive the attention they require. Read media releases from ForestWorks and the Minister for Vocational Education and Skills, the Hon. Luke Hartsuyker for more details. To support implementation of one of the most commonly used entry level qualifications within the newly endorsed RII Resources and Infrastructure Industry Training Package, SkillsDMC has developed a full resource kit containing the components required to deliver and assess entry level qualifications. This resource kit contains trainer program guides, learner guides with corresponding mapping information and training log book and can be purchased with optional assessment toolkits. For details, visit the SkillsDMC online shop. More information on the recent endorsement of the RII Resources and Infrastructure Industry Training Package is available on the SkillsDMC website. high risk licensing units for boiler operations. Read more about the Training Package. ‘Prepare for take off!’ is the key message from a five year study into the anticipated supply and demand of aircraft maintenance engineers and licenced aircraft maintenance engineers. Funded by the Australian Research Council and conducted by the University of NSW, the project examined short, medium and long term aircraft maintenance workforce needs for a growing regional aviation industry. The report on the study findings, The Future of Aircraft Maintenance in Australia: Workforce Capability, Aviation Safety and Industry Development, has been released and is now publicly available. The study estimates a 30% global workforce shortfall by 2025, with Australia and the Asia Pacific especially hard hit. It suggests that Australia focus on rebuilding its aircraft maintenance and maintenance training capacity to ensure we can handle our domestic aviation needs, and capitalise on our high standards and capabilities, to compete in global, niche markets. This report provides a comprehensive examination of industry and workforce needs and is essential reading for stakeholders concerned with development of the aviation industry in Australia. MSA was pleased to attend When one door closes: VET’s role in re-skilling displaced workers, a recent NCVER research forum held in Melbourne. The seminar was very well attended by all levels of government as well as training providers, businesses and universities. The panel sessions in the afternoon proved to be very lively sessions with many members of the audience asking pertinent questions. Among the speakers presenting their research was Kaye Bowman. MSA had assisted Kaye and her research partner, Dr Victor Callan from Queensland, in finding appropriate case study sites. • Industry restructuring and job loss: helping older workers get back into employment. • The end of car manufacturing in Australia: what is the role of training? Access the video and research papers. CPSISC has today released its second Case Study Booklet which showcases some of the substantial work CPSISC has been undertaking and illustrates the way in which CPSISC is helping to change the lives of people working in the construction and property services industries. The second booklet contains three key case studies ranging from working with a ‘buddy’ system in the Fire Protection industry, building a new future for an Afghani refugee in Australia and ensuring that there are qualified tradespeople in the plastering industry. Download your copy. The Australian Government is committed to increasing participation in STEM – science, technology, engineering and mathematics - in vocational education and training, schools and universities. A focus on STEM subjects is vital to ensuring young Australians have the skills and knowledge they will need to adapt to changing technological, economic, and social needs of the 21st century. Read about six Australian Apprenticeship Ambassadors already making their mark in the world of STEM. As a Workshop Controller at Mercedes Benz of Melbourne, Sevag is fulfilling a career dream he’s held from childhood. Completing his Australian Apprenticeship in Automotive Mechanical Technology (Light Vehicle) with WPC Group, Mercedes Benz of Melbourne and Kangan Institute of TAFE, Sevag’s been awarded the 2010 WPC Group Apprentice of the Year, the 2011 Snap-on Tools Apprentice of the Year and in 2012 was named runner-up to the Australian Apprentice of the Year Award at the Australian Training Awards. Read more and watch Sevag’s Story. Sarah began early childhood teacher training at university. Realising it wasn’t for her, and looking for a career that sounded interesting and matched her willingness to learn, she signed up for an Australian Apprenticeship in electrotechnology. Sarah has been Queensland Apprentice of the Year as well as a finalist in the same category at the 2013 Australian Training Awards, received Queensland Rail’s National Norm Dunshore Memorial Apprentice of the Year Award and is currently completing her third qualification. Read about Sarah and watch her story. Melinda felt obliged to pursue a tertiary pathway but her fascination for hands-on work led to work experience at Hargo Engineering followed by an Australian Apprenticeship in fitting and machining. As a qualified fitter and turner, she has won a gold medal in turning at WorldSkills Australia’s Melbourne Region competition in 2013, competed at the 2014 WorldSkills Australia National Competition and was awarded the Australian Apprentice of the Year Award at the 2014 Australian Training Awards. Read Melinda’s story and watch her at work. Luke was in his late 20s before he pursued his dream career in the automotive industry. Undertaking an Australian Apprenticeship in Automotive Mechanical Technology (Heavy Vehicle Mobile Equipment) with Hastings Deering, he was named the company’s 2011 Darwin Apprentice of the Year and came second in its Top Apprentice Challenge. Luke was a finalist in the Australian Apprentice of the Year category at the 2012 Australian Training Awards after being awarded the NT Austin Ashe Apprentice of the Year Award. Watch Luke’s story and read about his career. Growing up on a vineyard, Joel observed mechanics working on the equipment and began to envision his future career in the industry. Commencing an Australian School-based Apprenticeship in Automotive Mechanical Technology while still at school, he was awarded the Australian School-based Apprentice of the Year at the 2013 Australian Training Awards and had the opportunity to attend the APEC Youth Skills Camp in China in 2014. Read about Joel and watch an interview with him. Joshua deferred plans to study chemical engineering at university, opting to gain practical understanding first, and secured a traineeship with Origin Energy. He has now completed that traineeship, secured full-time employment and mentors two trainees who will work in Origin Energy’s chemical department. Joshua won the 2014 Australian Apprentice (Trainee) of the Year Award at the Australian Training Awards, was part of Group Training Australia’s Today’s Skills: Tomorrow’s Leaders program, and won trainee of the year awards from Group Training Australia and Laboratory Techniques. Read Joshua’s story and watch his story. Skilling for Growth, the conference theme, is focused on ensuring that Australia’s workforce is sufficiently skilled and agile to meet the economic challenges of constant technological change. Join with the group training network and be part of a critical conversation around the policy and practice required to ensure effective Skilling for Growth. Book early for the 2016 AITD national conference and save up to 20% off standard registration prices. AITD's Annual National Conference is a highly regarded event for providing delegates with high quality, dynamic presentations on an exciting range of innovative topics. We will be exploring technology, learning strategy, innovation, social and collaborative learning, leadership, talent development and more. Get involved in AITD2016 and maximise brand exposure. Contact AITD to discuss sponsorship and exhibition opportunities. The 2016 Conference programme includes keynote presentations from Sue Beitz and Nick McEwan-Hall that will address the current issues affecting VET professionals. VETnetwork Australia will also be hosting a Masterclass on Friday 29 July which will be available to all delegates at the time of registration. Registrations open early February and more information is available on the VETnetwork website. The National Centre for Vocational Education Research (NCVER) and CQUniversity are calling for abstracts for presentations and poster sessions for the 25th National Vocational Education and Training Research Conference No Frills. We invite industry, practitioners and researchers to share their work on vocational education and training. 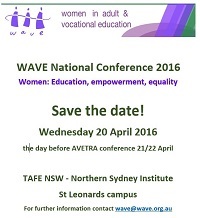 Monday 22 February 2016 - Call for presentations and poster sessions closes. Watch the National Skills Week website for the announcement of the 2016 theme and other details. AusAppPathways is a new app launched by the Australian Apprenticeships and Traineeships Information Service that helps jobseekers and students at the beginning of their career research to explore apprenticeship and traineeship pathway options that interest them. The app can also be used by people providing careers services to engage with jobseekers and students. AusAppPathways is free and available for Apple and Android devices. For more information and to download the app, visit ausapp. If you are interested in materials to help promote this new app please contact Emma Cook at emma@aatinfo.com.au or call 1800 338 022. Each VET Summit will be streamed via a new custom-built platform and will include 10 sessions over two days, with practical, useful information. Attendees will be able to view the content as it is being delivered and also be able to interact in a real-time discussion forum with the facilitator and their peers without leaving their desk. The program will be released in the coming months and will support RTOs to identify the changes they will need to make within their organisation using the new Standards, as well as assisting them with ways to facilitate and manage this process. • 15 and 16 March 2016 - Trainer and Assessor Summit. If you would like to provide feedback, supply an article for inclusion in the next edition or join our list of subscribers, please email skillsatwork@education.gov.au. The next edition will be published in March 2016. Submissions are due by Thursday 18 February 2016.